In classical combined pH electrode reference electrode is separated from the external solution by the junction through which the electrolyte leaks. Lost electrolyte must be periodically refilled through the filling hole, which makes these electrodes inconvenient to use, especially in field. Methods of slowing down the leak - like gelling of the electrolyte - have a side effect of shortening the lifetime of the electrode, as it is more prone to the changes in electrolyte composition due to contamination and diffusional leak of the ions. Contaminated gel can not be replaced, thus lifetime of gel electrode is rarely longer than several months. To prolong lifetime of such electrodes double junction is sometimes used. 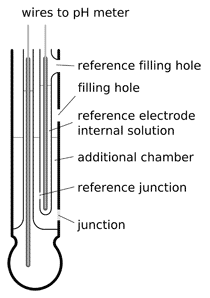 In double junction electrodes additional chamber is introduced between reference electrode and external solution. Before contamination from the external solution can get to the reference electrode it must diffuse through not one junction, but two (hence the name). Additional chamber works as a buffer, slowing down the changes in the composition of the reference electrode electrolyte. Double junction electrodes can work longer, but they are more difficult to make, thus more expensive. 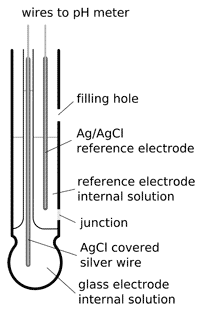 Note, that single or double junction refers only to the way reference electrode is made. While you will often see combination electrodes described as pH double junction, external reference electrode can be made double junction as well.